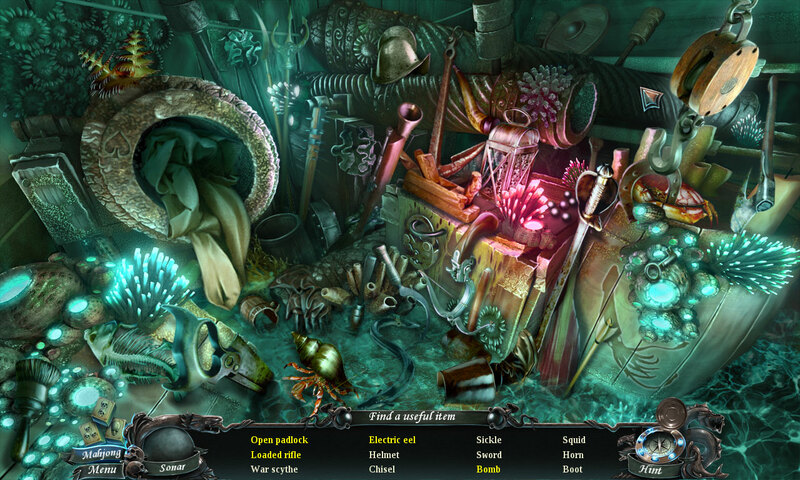 Nightmares from the Deep: The Cursed Heart is a hidden object puzzle game. My Dad is perhaps the biggest fan of this genre, he seems to have hundreds of the things. I noticed looking through them that a bizarre amount are set around horror in some way, this one is no exception dealing as it does with zombie pirates, ghosts and curses. This game first came out back in 2012 on the PC, this is apparently the first one of it's type to come out on the PS4. 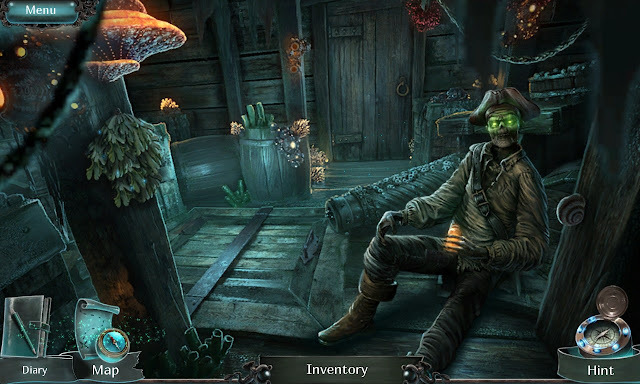 You play as the owner of a museum who has just received the body and artifacts of legendary pirate Captain Remington. However once you adorn the corpse with it's belongings it comes to life and kidnaps your teenage daughter. Sneaking aboard it's pirate ship ( with the living dead acting as crew members) you end up at his old fortress; Skull Island. Here you must seek out the golden doubloons that will return the undead pirate back to his mortal form so that you can rescue your daughter. Originally hidden puzzle games were just that; screens upon screens of hunt the objects with a story loosely fitted around it. The genre evolved though and nowadays the hidden puzzle sections are only a small part of the overall whole, the rest of the game being based around fun, though shallow more traditional ones. The problem with these games is often what you are being asked to find is not really obvious, a lot of objects are geared towards American versions of objects, in the case of The Cursed Heart there were a few times when the actual object names seemed to have spelling errors. Hidden puzzle scenes here are never too bloated and so are always easy to do with mostly large items to find (a penguin, an African mask, and a gold bar as examples). If you find it too hard there is a weird Mahjong game you can play as an alternative. You get a generously sized circle you use to find the objects, I found on a fair few times the game wouldn't recognise what I was trying to highlight and so I got unfairly penalised with a missed guess. So the other half of the game is exploring the various locations and solving puzzles. These range from arranging wooden blocks to form a picture, following instructions to make a potion, to working out how to open doors and secret passages to get deeper into the game. There are four main areas in The Cursed Heart. The museum is the prologue level that teaches you the controls, then there is the pirate ship, Skull Island, and an extra chapter after the main game is done with. While this is horror and features plenty of zombies and skeletons this is in no way scary at all. This is designed to appeal to all ages and so you have an antagonist with noble motivations who maybe isn't as bad as he at first seems, his crew on the other hand are played more for comedic effect, they are completely nonthreatening to you. The characters mostly reminded me of Monkey Island, there is even one part where a seagull steals an essential item you needed which I swear was a direct homage to a puzzle in Le Chuck's Revenge: Monkey Island 2. If you ever get stuck a quick tap of up on the D-pad will show you where to go next, so it is impossible to get stuck for too long. The plot itself isn't that exciting, it plays out through diary entries, and by talking to characters. Budget constraints are never too hard to see, such as characters mouths not attempting to sync up with what is being said, and static background images (that at one point reveals the solution to a puzzle by already showing as solved). It all looks nice enough, it's a port of a five year old game so no way is it going to impress you, but it is functional. The extra chapter after the credits is probably where I had the most fun. This extra one featured a more unsettling story and was set in a tightly designed location. 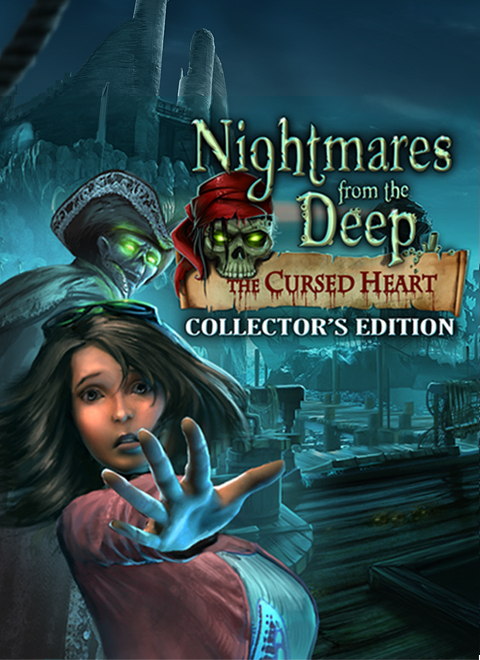 The Cursed Heart is never going to appeal to everyone, personally I only brought it due to it being on sale for a dirt cheap price. There is plenty of game for the low price, while it is satisfying to solve the simple puzzles, you need to keep in mind as a game it is very basic and with not much replay value.